Come sail away with our Anchors & Argyle design. 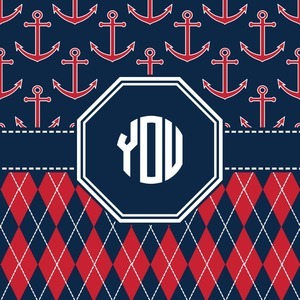 This design is a great balance of sea and land with nautical, red anchors on navy background and preppy red and navy argyle. Our design shown in bold navy and red, but the colors can be customized. Along with the colors, the monogram color, label shape, font, and ribbon style can be customized. Add your monogram, initial or name to make it uniquely yours.